2 of 4 Combine flour, cocoa, pudding mix, baking powder and salt in bowl. 3 of 4 Beat butter and sugar until light, 2 minutes. Beat in eggs, one at a time, beating well after each. Alternately beat in flour mixture and the milk, beginning and ending with flour mixture. Stir in vanilla and pour into prepared pan. 4 of 4 Bake at 350 degrees for 46 to 50 minutes or until cake springs back when pressed. Cool cake in pan 15 minutes. Remove cake from pan to rack; let cool completely. 1 of 1 Place cream in small saucepan. Bring just to a boil over medium heat, about 3 minutes. Add chocolate; stir until melted and smooth. Return to low heat, if needed. Spoon over cake; let stand. 1 of 1 Combine white chocolate and oil in small microwave-safe bowl. Microwave about 1 minute, stirring halfway through, until melted. Stir until smooth. Let cool slightly, 5 to 10 minutes. 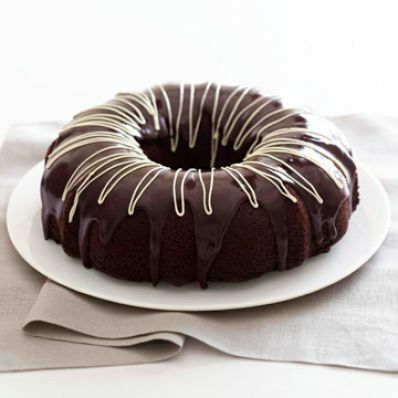 Drizzle over Chocolate Glaze; let set. Makes 16 servings.